Luigi's Mansion: Dark Moon continues to build on the formula laid out by the GameCube original. A far cry from the vast expanding platformers that made his older brother famous, Luigi's solo mission is a claustrophobic game of exploration, uncovering secrets and doing battle with specters of the cutest imaginable variety. The poor coward can barely hold his Poltergust 5000 vacuum cleaner at a steady level, but he's going to have to keep his wits about him if he's to uncover the darkest secrets of these new haunted houses. The latest four minute Japanese trailer shows the many ways Luigi can manipulate light and the suction from his vacuum to uncover hidden switches and buried treasure. Luigi's impressive piece of equipment doubles as a hose, a balloon inflator, and even a flame thrower, allowing him to press on through his battle with not only the undead residents, but also the deadly elements which block his path. 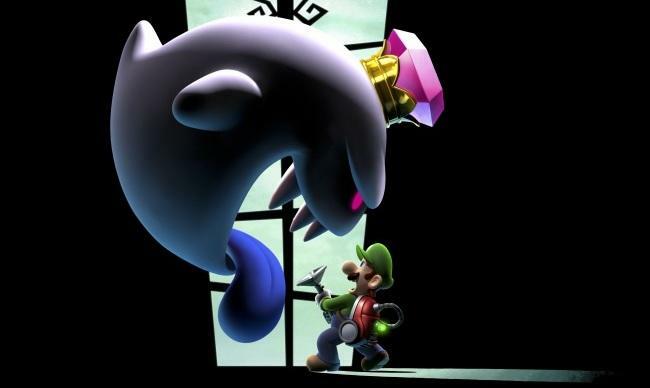 Luigi's Mansion: Dark Moon is shaping up to be one of the biggest and most impressive 3DS titles to date. Keep an eye on this promising game here as we are just as excited to play it as you are. It is currently scheduled for a March 24th launch exclusively for the Nintendo 3DS.